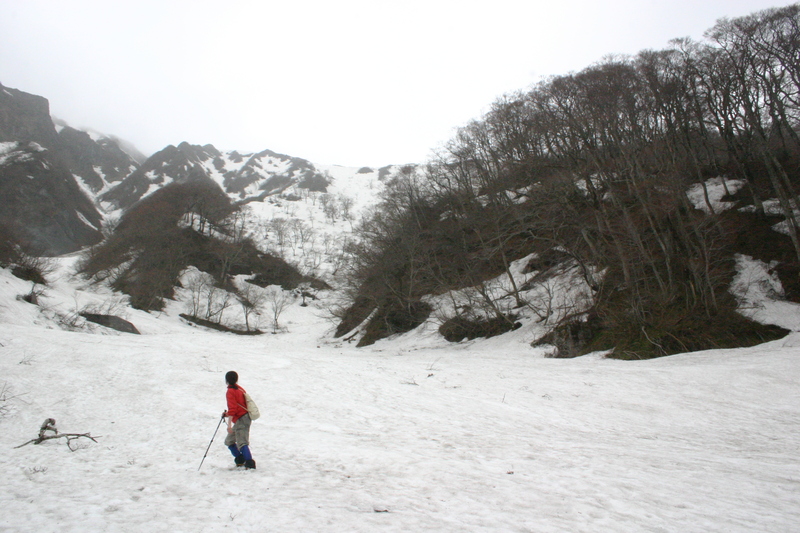 Spring hiking in the Chūgoku region of Japan is always a gamble. Despite the relative lack of elevation, the snow squalls blanket the upper reaches of the mountains, providing meters of powdery fun in the frozen milliseconds of winter. 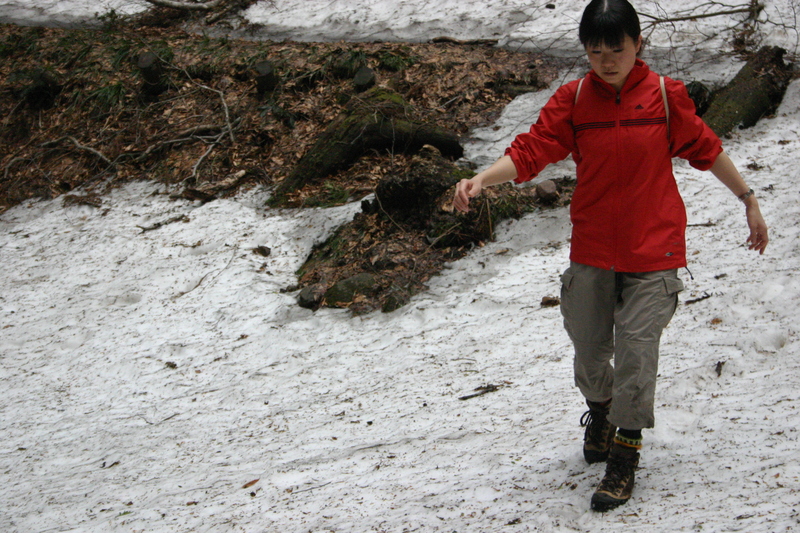 Spring thaw means spring slush, and a good excuse to drag my friend (and slush novice) Hyemi up an obscure range in northern Okayama by the name of Nagisan. I boarded an early morning train to Wake station for our meeting point. I had first met Hyemi at Kitazawa-tōge the previous summer and it was great to finally find someone in Okayama to accompany me on mountain pursuits. She pointed the car north and before too long we were tightening our shoe laces and placing our first footfalls on the well-worn path. After receiving a bit of advice from the locals, we chose the C course due to the unstable snow in the gullies of the popular B trail. The well-used track soon left the forest road and traversed through a grove of Hinoki cypress trees recently stripped of bark. The brilliant ruby tints of the exposed trunks glinted peacefully in the cloud-filtered light. Apparently this bark was recently harvested for the re-roofing of a local shrine. It’s unclear whether the bark will simply grow back or if the trees have just been left to die a slow death from malnourishment. A future visit will likely help answer that question. Switchbacks coaxed us up the ever-steepening slopes of this dormant volcano, whose muddy tracks soon disappeared under the first folds of rotting snow. Sinking up to our ankles, we followed the freeze-thaw grooves of previous hiking parties up a steep gully with nary an end in sight. Stray too far from this delicate maze of footprints and end up knee-deep in the sludgy quicksand. I kicked steps as elegantly as I could as Hyemi followed in eager pursuit. 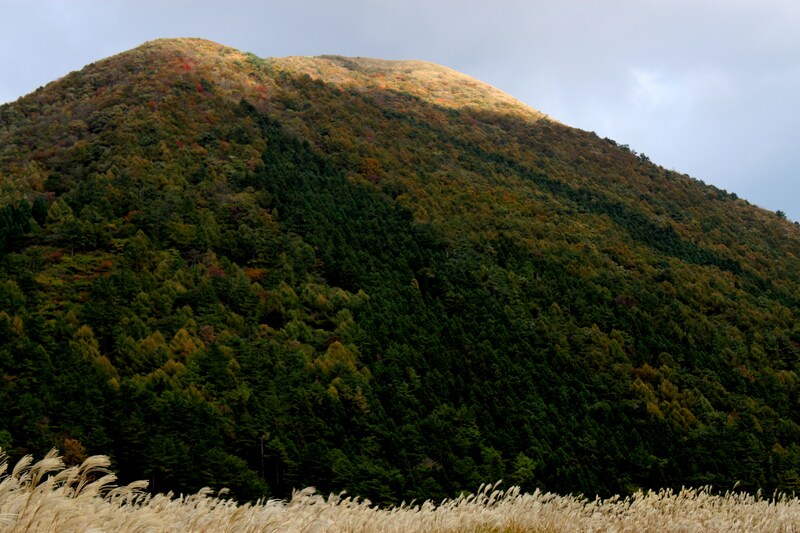 We hit the ridge at Ōkami-iwa (大神岩), a brilliant rock formation affording refreshing views down to the valley far below. 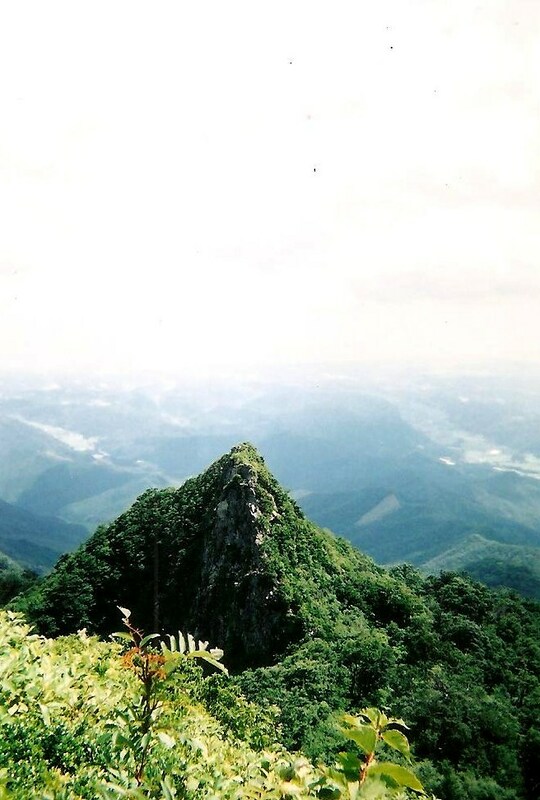 Named after the Japanese wolf, the rock formation derives its name from the creatures who used to frighten the locals from howling down from these exposed heights many centuries ago. The trail flattened out on a broad ridge covered with meter-deep slush. We marched along in succession, the silence pierced by the Michael Jackson screams echoing from Hyemi’s larynx each and every time she sank up to her hips, which seemed to occur at every 4th footfall. I simply let out a grunt at such inconveniences as we contemplated potential retreat options. Despite the less-than-ideal conditions, the mid-week ascent was dotted with other like-minded fools, including one unfortunate trail runner who was obviously less prepared in his hiking short and trail runners. 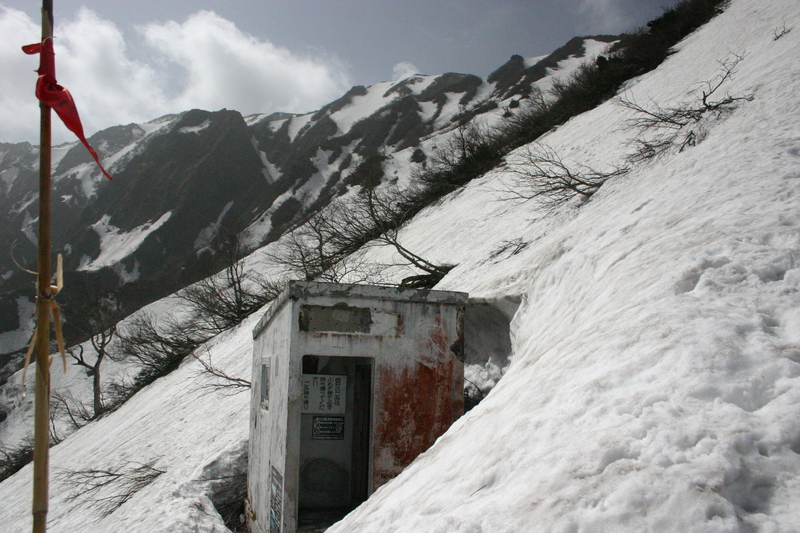 At the summit plateau, a small open shelter provided a dry place to stretch out and refuel. This shelter later became a victim of a strong typhoon and there is currently no plan to reconstruct the rest house, as there is a stronger emergency hut a short walk away. Speaking of emergency shelters, we dropped north to the saddle housing the concrete structure before the final scramble to the summit, where the haze cut off views of Mt. Daisen and Hiruzen to the northwest. Retreating back to the shelter, we ducked inside to escape the strong winds and to engorge in a proper lunch and celebratory coffee, a necessity in my post-Hyakumeizan pursuits. 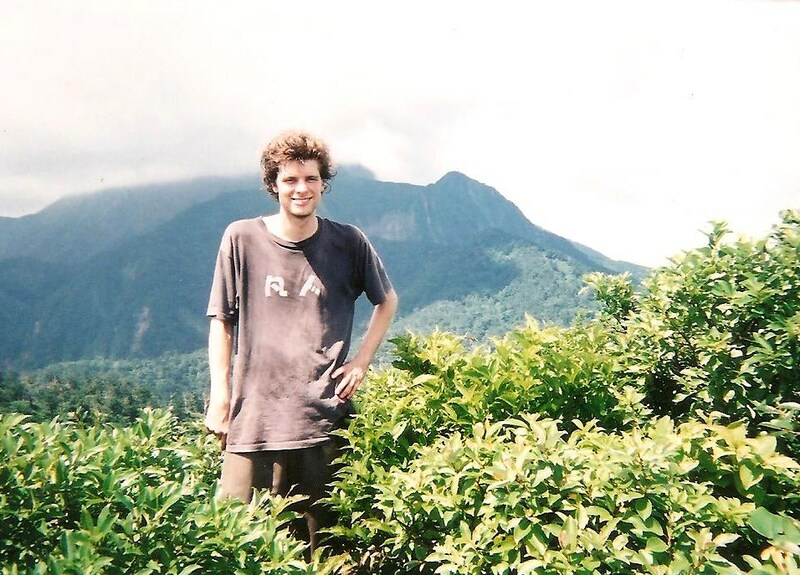 I used to think that summiting was the most important part of the hike, but once I reached the age of 40 I can definitely tell you that a good strong cup of top-quality joe trumps all else. The ‘piston’ hike back to the car was non-eventful, leaving us enough time to hit a local hot spring and to a feast of pizza and gratin at the aptly named Pizza King near Wake station. 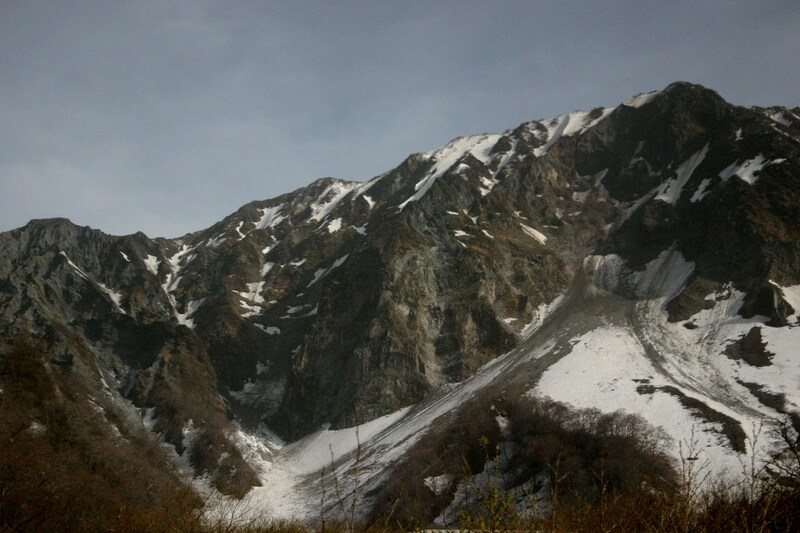 Hyemi promised to guide me up the Wake Alps, a hike that will finally come to fruition this very month in fact. I’m looking forward to the pizza as much as the trail itself. Kanako and I woke up at 6am, shuffling around the room trying to figure out what gear we needed for our early morning climb. The sky looked a bit hazy, with soft light filtering through a thin blanket of high atmospheric cloud. 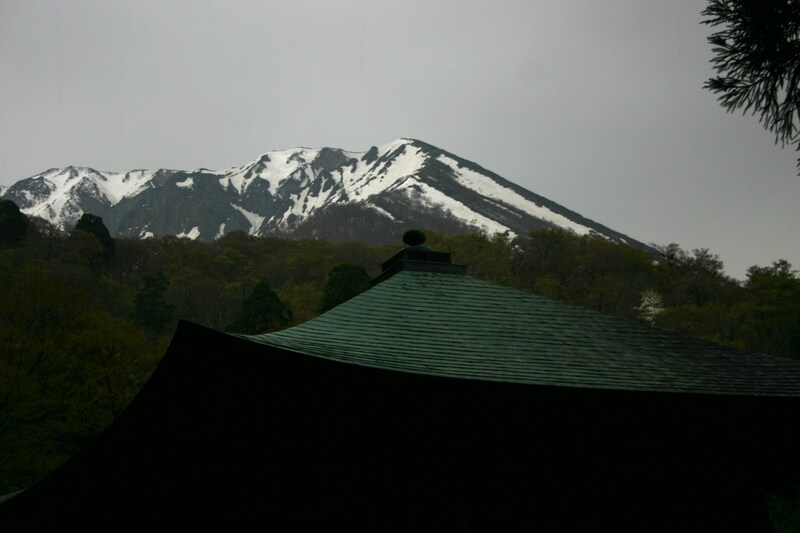 After a modest breakfast, we dropped our extra gear in the lobby of the shukubo and strolled off towards the start of the mighty volcano. The monk told us a bath would be waiting upon our return, so we had good reason to stay within schedule before the afternoon bus. 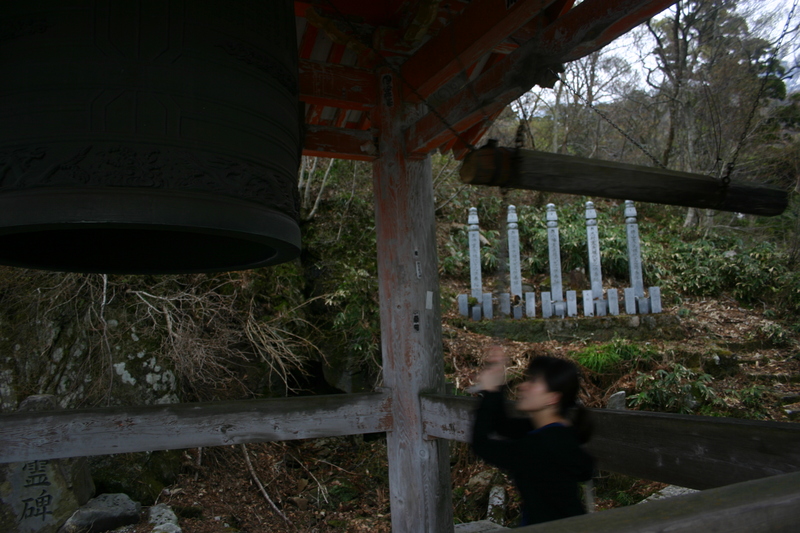 The initial climb past Amida temple was a breeze, thanks in part to the large stone steps that soon gave way to wooden steps. 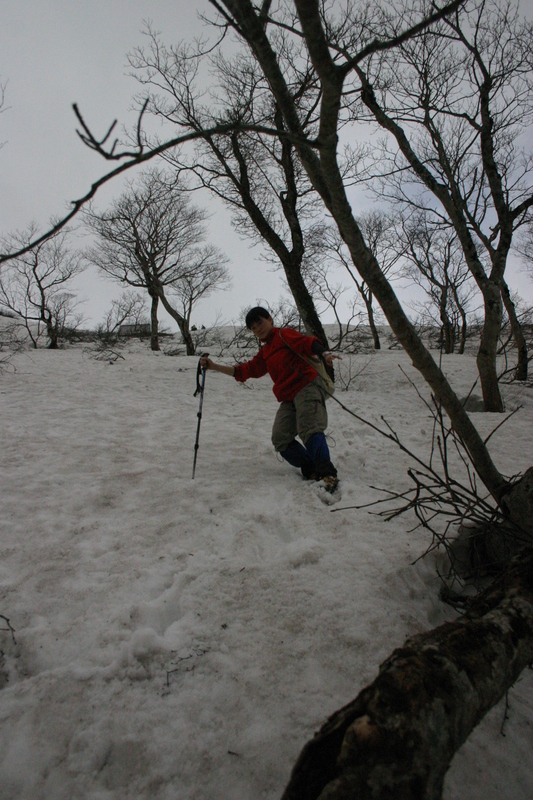 These climbing aids soon vanished into the deep snowpack, however, and the kick-step march to the ridge line commenced. The path was hardly deserted, as the clear weather and start of Golden Week brought out the first significant crowds of the year. Safety in numbers I suppose, as long as someone above doesn’t trigger a snowslide! The cold, wet slush permeated through my well-worn footwear, soaking my merino wool socks well before the 5th stagepoint. Now wasn’t the time to ponder a new pair of shoes, but I wondered if that Montbell shop in the valley below could perhaps deliver gear to the mountain? Now that would be service worth payting for! Kanako and I continued our death march will increased rigor once we were above the trees. Reaching the concrete bunker of a hut at the 6th stagepoint, we caught our first glimpse of the intricately rocky edifice of Daisen’s serpentine figure. Impressive. Daisen is no stranger when it comes to signposts, as every 100 meters of elevation gain is clearly marked as if to taunt you to a time-trial. I can’t help thinking if these landmarks were put there to help with mountain rescues, or perhaps for groups to scribble in their meticulous notebooks: “reached 1400m at 7:42am. Rested for 3 minutes and 27 seconds. 3 komakusa flowers spotted.”. It kind of takes the fun out of climbing, don’t you think? It was right around this 1500m mark that I’d made a stark realization. I could barely see down to the village where we started, which was only about 2 kilometers away. The Sea of Japan and Yonago city? Competely enveloped in this yellowish haze. “Wait a minute,” I thought “this is kousa!” For those who don’t live in Japan, every spring the country in inundated with sand blowing from the deserts of China. It picks up pollutants on its way through the mainland and deposits them in Korea and Japan. Usually this aeolian dust occurs in early to mid March, not in early May! I erroneously thought that the strong winds from the previous storm would blow all the pollutants further east, not bring more with it. Although I’d timed the weather perfectly, I’d forgotten to factor in the yellow sand. Oh well, we might as well enjoy the snow at least. 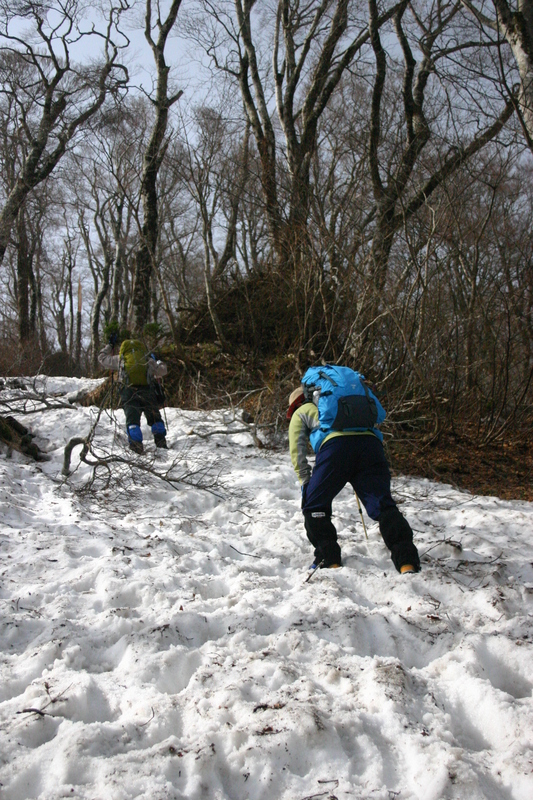 The fearless couple pushed on, reaching the wooden planks just below the summit of Misen. 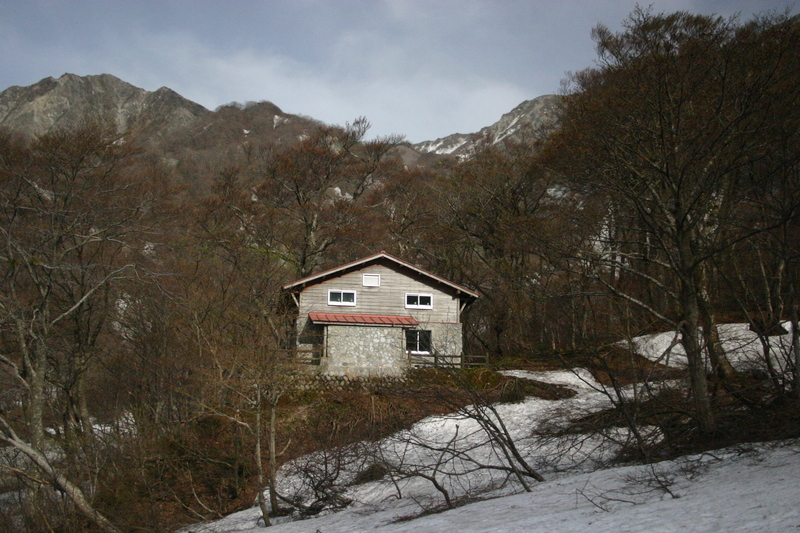 Soon the hut came into view, still half-buried under the winter snows. 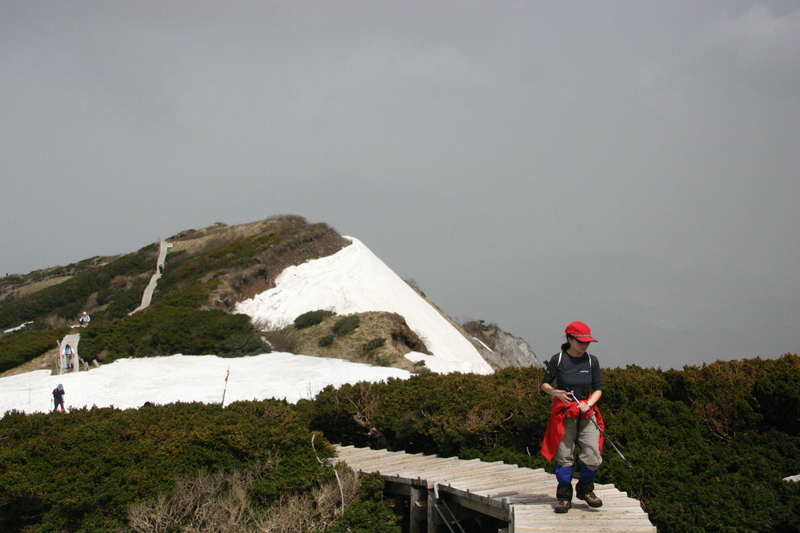 Several dozen people rested on the platforms of Daisen’s bald summit. We picked a place as far away from the smokers as possible before digging into our lunch boxes. Even though it was much better than my first time around, I couldn’t help feeling a bit of disappointment for not getting good visibility. We didn’t even bother with the knife edge ridge to Ken-ga-mine, as there wasn’t enough snow and the cloud was threatening to come in. Still, being here was much better than sitting in the middle of the city. The time to descend was once again upon us, so we decided to put on our crampons. We’d done fine enough without them on the climb, but wanted a little extra grip for the downward journey. Scrambling back to the emergency bunker at the 6th stagepoint, I peered over the edge towards the steep, desolate gully. 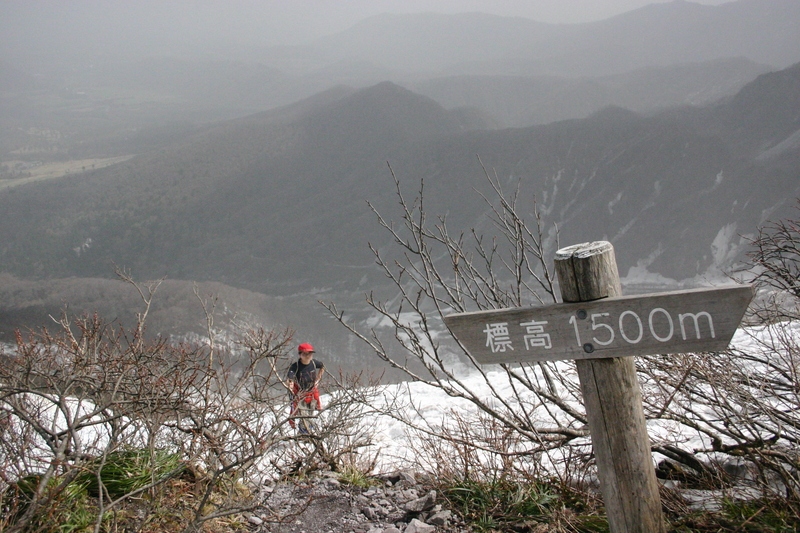 I motioned over to Kanako, who quickly joined me as I started kick-stepping a zig-zag path down the 50 degree slope. I ignored the shouts from the others on the ridge line, who obviously underestimated my abilities. I’d already checked out this path during my recon mission the previous day, and the scuff marks proved my initial thoughts, that others had used this gully as a climbing route. Sticking to the beech trees in case of avalanche, I carved a navigable path, hopping from tree to tree while my trusty partner quickly followed suit. 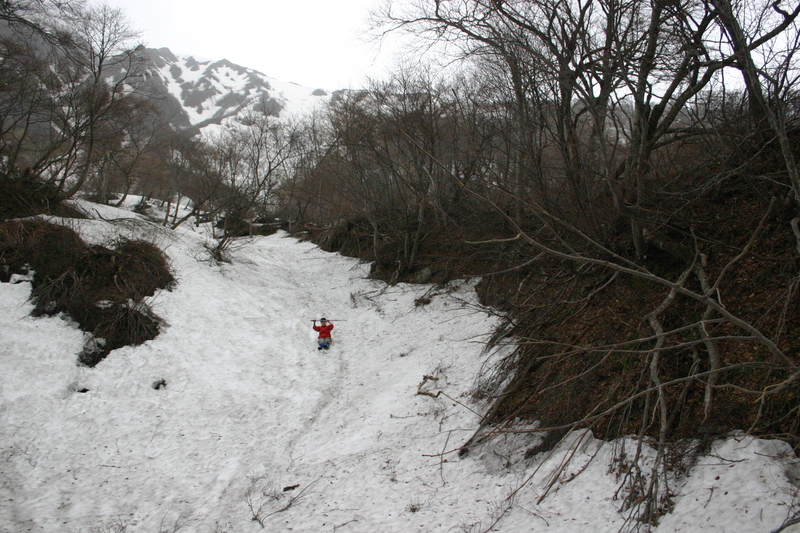 Once the slope eased a bit, I headed out to the main chute and kick-stepped a route straight down. Kanako, obviously bored with my delicate hoof prints, came swooshing past in full glissade mode, trekking pole raised above her head and a gigantic grin on her face. “Two can play at this game”, I shouted, lowering myself into her chute path and quickly overtaking the fearless leader. I was gaining speed quickly through the melted mush, but kept in control long enough to snap a few photos. At the bottom of the avalanche chute, I looked back at the ground we’d covered: 200 vertical meters in less than 10 minutes. Through the trees we spotted the emergency hut I’d discovered yesterday, where we stopped for lunch. My backside was completely soaked, including the entire contents of my wallet, but the slidding was well worth the drawbacks. 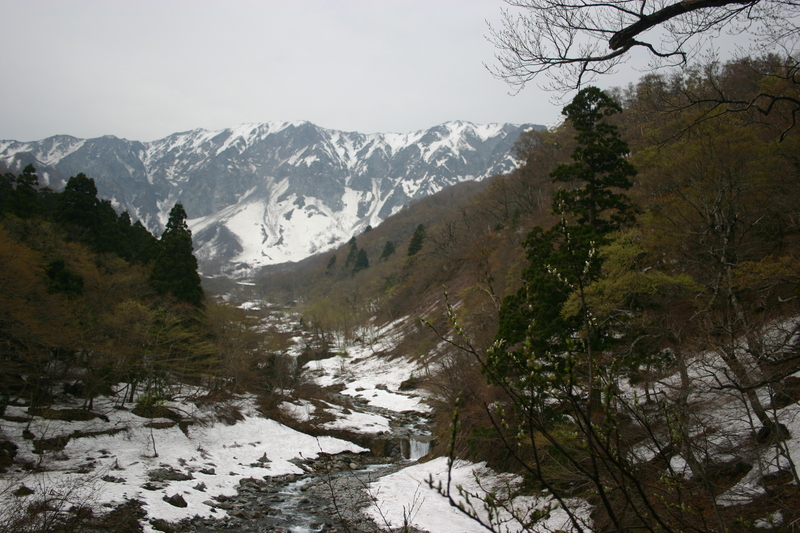 Soon enough, we arrived back at the shukubo, where I hung my clothes out to dry in the sun. 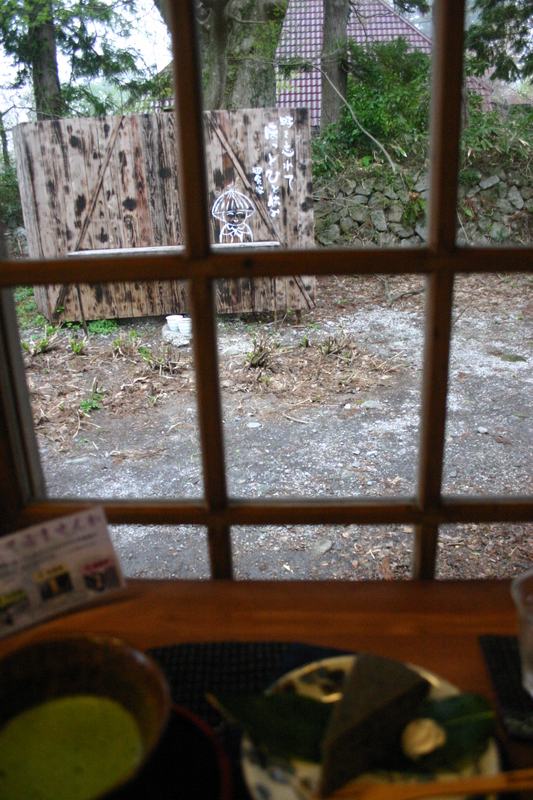 We even had time for a quick cup of coffee and the cafe we’d visited the previous day, before boarding the bus back to Yonago. Our onward journey took us to Tottori and its sand dunes, but the thoughts of Daisen’s unforsaken rocks remained. 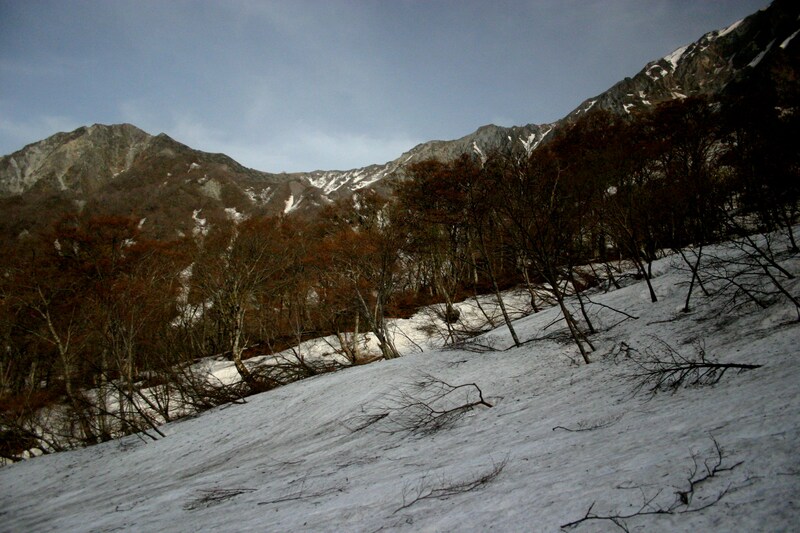 A winter ascent is awfully tempting…. “Sure you can leave your pack here”, replied the cheery worker manning the info. desk at the Visitor’s Center. “Just remember that we close at 5pm.” Sometimes a strict deadline really gets you up and going. Here it was 2:30pm and the powers that be had given me just 2-1/2 hours to complete a hike most do in 6. Time to put the cardio to test. The first half of the climb up Tottori’s highest peak involves an endless array of wooden steps, with row after row of daytrippers slowly making their way off the volcano. I must’ve been the only one on the way up, as I passed no one despite my lightning speed. I reached the emergency hut at the 6th stage point in just over 30 minutes and continued into the thick cloud and sticky weather unabated. 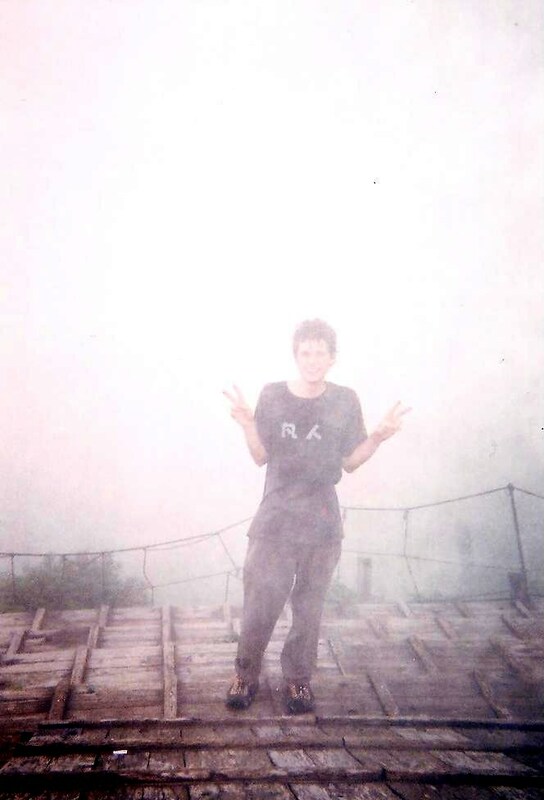 Reaching the official safe highpoint of Misen, I abandoned all hope of making it over to Ken-ga-mine. For one, I had absolutely no idea where it was. Plus, I had a pack full of camp gear waiting 1000 vertical meters below. After a compulsory photo, I raced down the rocky volcanic slopes, opting for the shortcut circuit through the Mototani flats. After passing by an obscene collection of concrete dams, I hit my stride on the final stretch to Daisenji temple. Time was really tight, so I bypassed the historical artifacts of the rustic temple and arrived back at the Visitor’s Center with 10 minutes to spare. “Woah, we definitely thought we were going to have to stay open late for you”, exclaimed the staff, still shell-shocked at my early return. In reward for my spartan effort, the staff gave me a ride to Kawadoko, where I pitched my tent by a small stream. Fireflies lit up the valley shortly after dusk, and I prepared for a long traverse the following morning. 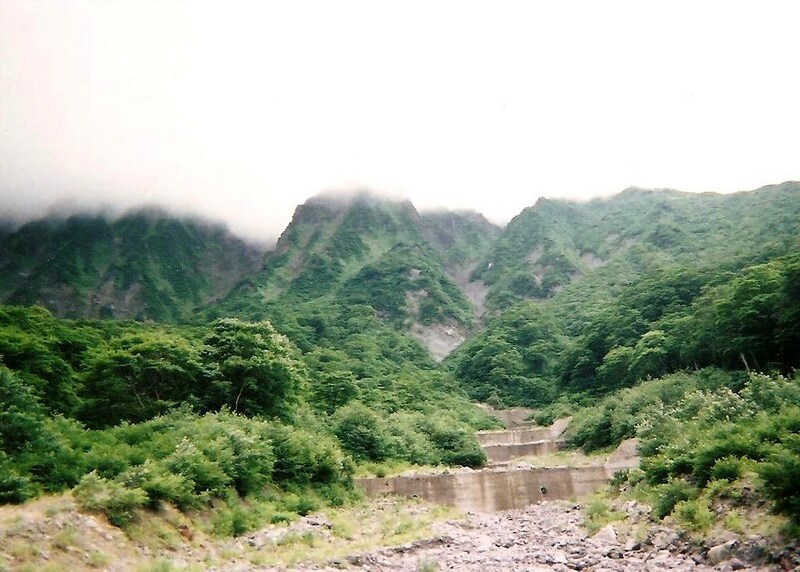 The humidity hung in the air like a wet towel on a drying rack as I started the steep climb towards Oyasumi-toge. 3.5 liters of water literally weighed me down as I stopped for a quick sweat-drenched break with some fellow daytrippers. 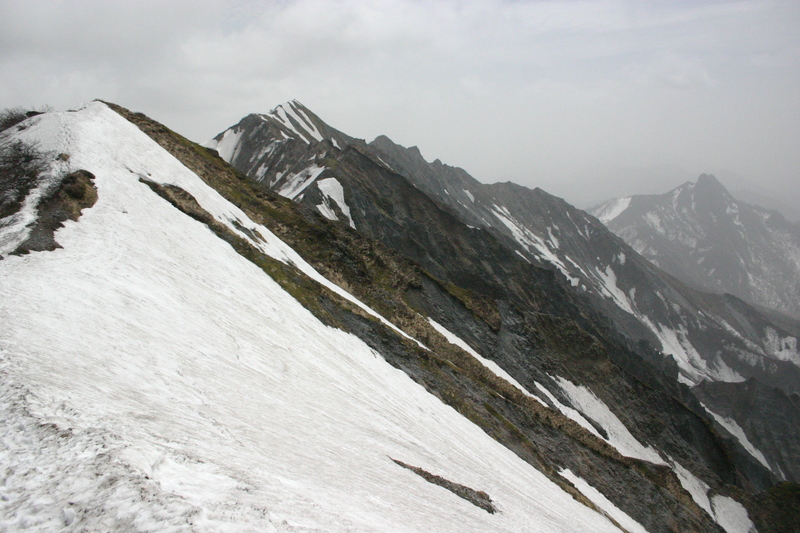 Most were on their way up the gnarly ridge towards Utopia hut, but I was headed further north towards Yahazu-ga-sen, a knife-edge climb taking the better part of an hour to inch though. The rest of the traverse quickly became a blur in the afternoon cloud and sweat, though I do remember a nice waterfall near the shrine at Senjo-san. Declaring it too hot to overnight on the bald fields that flowed over Mt. Senjo, I quickly descended to the road, for I heard the sound of an engine approaching. I arrived just in time to flag down the driver, who gave me a ride to Yonago station. 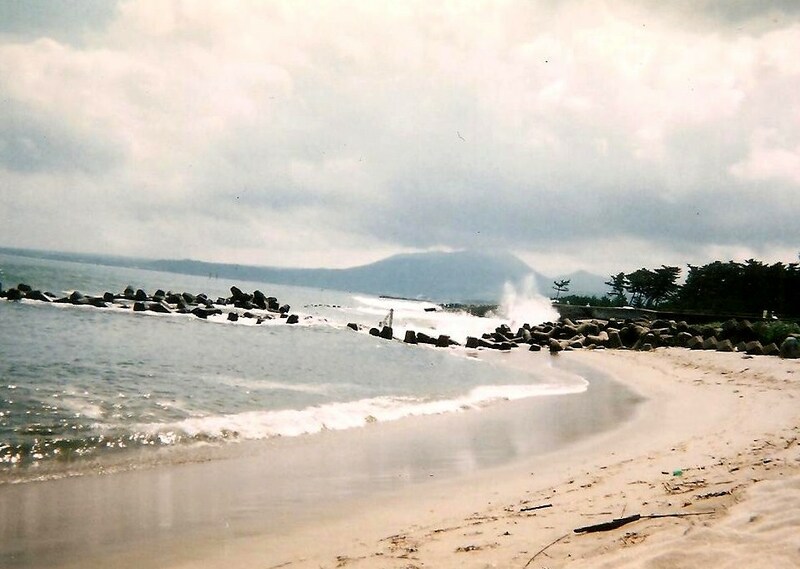 From there, I walked out to the local beach and spent my remaining night in the wilderness trying to sleep through the chaotic cacophony of teenagers setting off bottle rockets all around me. Daisen deserved a much longer visit the second time around, and I knew I needed to find an opportunity come back.